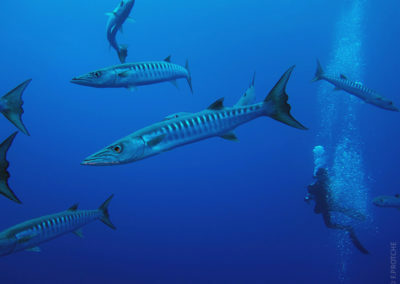 The Great barracuda (Sphyraena barracuda) appears as the “giant” of the barracuda family. It measures around 6.5ft; it is the most impressive species in size. This long fish can weigh up to 110 Lbs. It has a silver-grey color that makes the species difficult to notice in the blue ocean. 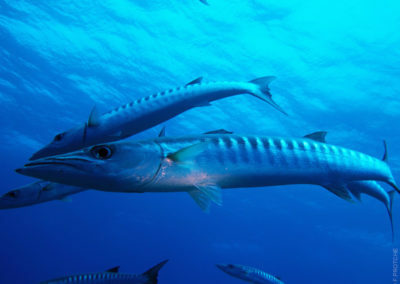 The adult barracudas have black streaks on its back part of the body. These streaks help identify each particular individual. 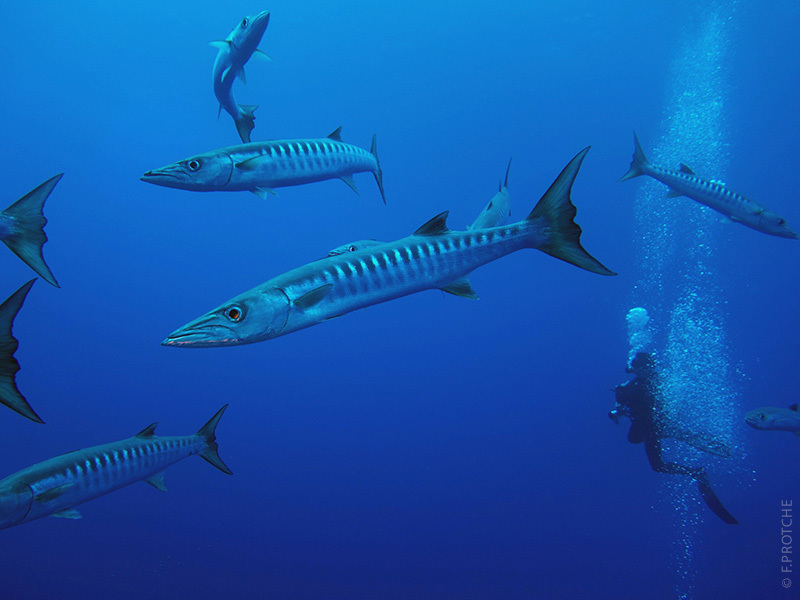 The Great barracuda has a large prominent jaw giving it an aggressive aspect. . The Great barracuda is shaped like a torpedo. It hunts its prey with lightning attacks, reaching a maximum speed of 45 Km/h. It uses a well-developed swim bladder as a buoyancy compensator to attain different depths. This predator diurnal, hunts in the day and feeds on small fish, squid, octopi or shrimps. It is a very curious species often approaching divers attracted by their bubbles. 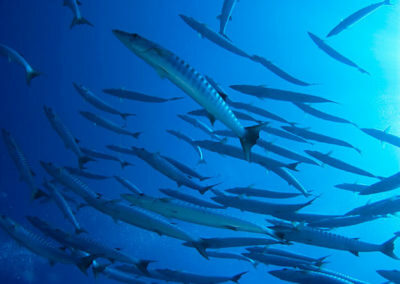 In French Polynesia, the barracuda is a pelagic fish consumed only small proportion because of its presumed link with ciguatera poisoning. 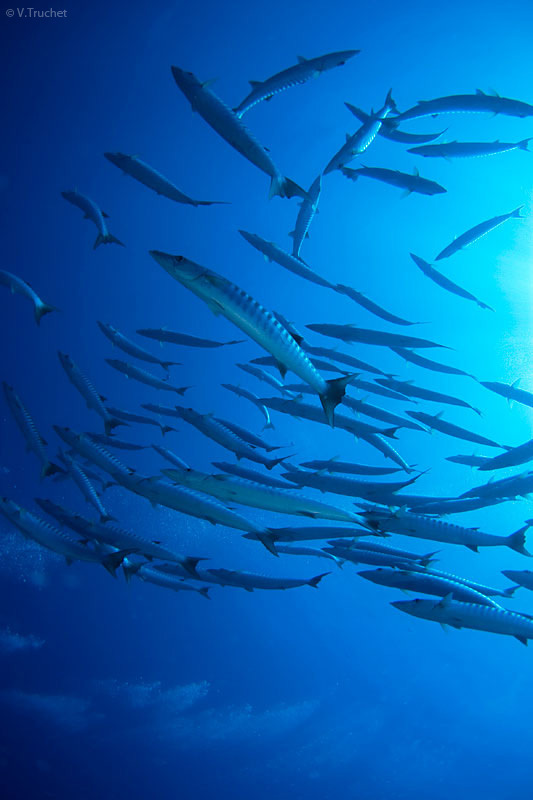 Thus, you will probably encounter numerous great barracudas during your next dives in South Pacific waters.